So here we go into another year of who-knows-what. One thing we do know is that Satan will continue to ratchet up his assault on the followers of Christ. Why? Because his primary goal is to STOP THE TRUE WORD OF GOD from reaching people’s eyes and ears. He fears those who wield the sword of the spirit like Jesus did. I believe there is a possibility that 2015 may bring more calamity than we have yet seen, so we had best buckle up for safety, that is, totally sell out to trusting our heavenly Father and acting accordingly. Yahweh is my rock, and my fortress, and my deliverer; my God, my strength, in whom I will trust; my buckler [shield], and the horn of my salvation, and my high tower. Another thing we know is that our loving God is constantly working in all things to bring to pass the best for us. Our role in working with Him is to meet Satan’s aggression with aggressive trust, aggressive praise, aggressive thanksgiving, aggressive holding forth the Word of life, and aggressive love. As we do, we give our God opportunities to BE GOD for us, and His miracle-working power is still just as real as ever. 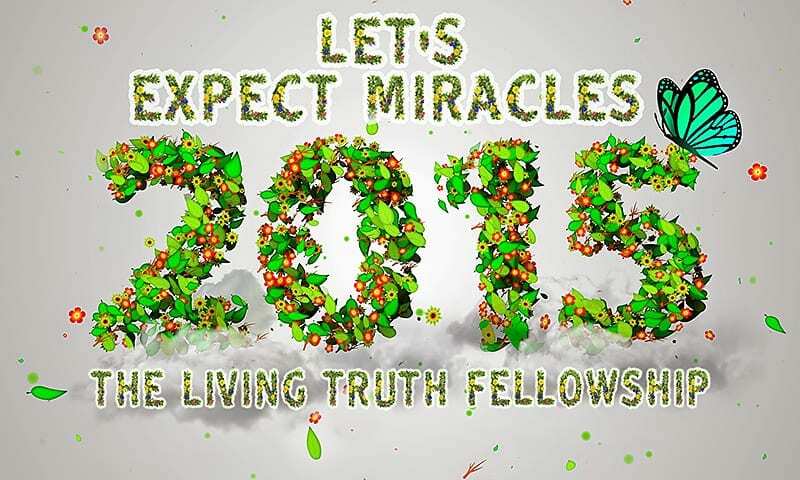 Let’s EXPECT MIRACLES in 2015! As followers of Christ, we cannot stick our heads in the sand, and we must not underestimate the extent or the power of evil in the world today. Yes, it vexes us to think about it, and yes, it can weary us to combat it, but as warriors for the Lord Jesus, that is what we are called to do—as our Lord did. At every opportunity he interrupted Satan’s status quo and, as per 1 John 3:8, carried out his mission of destroying the works of the Devil, which one day he will do in toto. This means that there are plenty of really bad people diligently advancing the Devil’s agenda. Some historical examples: Genesis 4—Cain murdered Abel. Genesis 6—demons took on human form and mutated the human race via the Nephilim, who brought unspeakable wickedness to the earth. By the way, they showed up again after the Flood to try to destroy Israel, the bloodline of the Redeemer, and I don’t think the world has seen the last of them. Genesis 10/11—Begat in the cursed line of Ham, Nimrod (whose name means “Rebellion”) was just about the personification of the Devil. The founder of Babylon, he tried to become the universal ruler of mankind, that is, to establish a one-world government. Here’s a link to Appendix 28 in The Companion Bible, with more about this horrific human. Based upon what I see in Scripture about the Devil and how he operates, and as corroborated by the wealth of related information available on the Internet, I do believe there is still a nefarious, inner-circle cabal that is pulling the strings to control much of the evil going on in the world, and they are not generally people we hear about on the news. “CONSPIRACY THEORY? !” It’s no theory; it’s biblical truth. Please read Genesis 10:8-10and 11:1-9 to see the earthly beginnings of this conspiracy that God temporarily slowed down when He knocked over their stupid Tower of “Babble.” He scattered people all over the earth and gave them different languages so the bad guys would have a hard time conspiring, but we know from Scripture that the same satanic conspiracy has been going on ever since, and it has steadily continued to accelerate as advanced technology erases such boundaries between people. As a spirit being, the Devil needs to work through people, and he has cleverly conscripted thousands who have completely sold out to him and who are bent on wreaking havoc on mankind, motivated by the lie that doing so will give them power and riches. Of course, he is using millions of other people as unwitting pawns in his relentless attempt to thwart the purposes of God. 2 Corinthians 11:14 tells us that Satan masquerades as an angel of light, and the fact that some of those who work for him today call themselves “the enlightened ones” is significant. We have in the past given this link to Know Your Enemy, produced by The Fuel Project, but here it is again in case you have not seen it. I see it as a concise history of evil that clearly shows how the worship of Satan has spanned the centuries since Genesis, infiltrating basically all major religions and governments. As soldiers for the Lord, we are certainly to spend more time practicing our own strategies than scouting the enemy, but what strategy we employ in a given situation depends on what our opponent is throwing at us, so we must “not be ignorant of his devices” (2 Cor. 2:11). Throughout history, one of Satan’s main goals has been to keep people in the dark and prevent them from seeing the light in regard to that which is most important. Historically, what the majority of people have believed about most important issues has been absolutely wrong, e.g., the flat earth, the earth-centered universe, et al. Today, what the majority of people believe about the origin of life, health care, nutrition, food, the banking system, the motives of government, and religion, is pretty much the opposite of reality. In Christianity, the Trinity is the chief example of the degree to which Satan can blind people and get them to suspend all reason, logic, and linguistic principles, and believe absolute gibberish. Perhaps the most practically harmful lie is that God is in control, that He has a Master Plan (actually, He does: Jesus) that includes tragedy and suffering, and that He causes or allows everything. A corresponding fallacy is that God has absolute foreknowledge, but that is not what His Word says (see Segment 14 of ODWTC). He does not know exactly what 2015 will bring you because your future free will choices do not yet exist to be known. Each day of this coming year will be for you a clean slate upon which you can choose to write the Christ-honoring story of your wonderful life. God and the Lord Jesus will be flanking you each step of the way on your path of righteousness and doing their best to guide you into what they know is best for you. How EXCITING does that sound? Many people, even Christians, wonder why God does not destroy the Devil and all wicked people. First of all, He will, in due season. But, as Jesus said in Matthew 13:30, God is now allowing the “tares” to grow up with the wheat. 36 Then Jesus sent the multitude away and went into the house. And His disciples came to Him, saying, “Explain to us the parable of the tares of the field.” 37 He answered and said to them: “He who sows the good seed is the Son of Man. 38 The field is the world, the good seeds are the sons of the kingdom, but the tares are the sons of the wicked one.39 The enemy who sowed them is the devil, the harvest is the end of the age, and the reapers are the angels. 40 Therefore as the tares are gathered and burned in the fire, so it will be at the end [closing time] of this age. 41 The Son of Man will send out His angels, and they will gather out of His kingdom all things that offend, and those who practice lawlessness, 42 and will cast them into the furnace of fire. There will be wailing and gnashing of teeth. 43 Then the righteous will shine forth as the sun in the kingdom of their Father. He who has ears to hear, let him hear! As I stated above, it is now WE, THE BODY OF CHRIST, taking his place on the earth and empowered by our Lord, who are commissioned to destroy as much of the work of the Enemy as we can. Because Satan is conspiring against God, Christ, Christians, and the world, we should be inspired to perspire in doing all we can to thwart his evil efforts. We can rest assured that our God knows who the bad guys are, and that He is doing all He can—which is A LOT—to thwart their efforts and buy us time. And when you read “the last chapter,” you see the GOOD NEWS: WE WIN!!! As we stand on the edge of another year, each day of which brings us ever closer to the appearing of our Lord Jesus to take us out of here, I think about how much God must value faithfulness. How many Christians do you know who (a) have abandoned the faith altogether, or (b) have pretty much given up praying/reading the Word/sharing it/fellowshipping/giving, or (c) been duped into believing error about the Word, or (d) are just going through the motions without real zeal? Too many have been consumed with self-pity, saying “Woe is me” (which in effect is saying, “Whoa is me”) and have thus stopped moving forward. When the Lord Jesus gathers us together, he will richly reward those members of his Body who have stood faithfully no matter what. In that light, here is my prayer for us all: “May the Lord direct your hearts into God’s love and Christ’s perseverance” (2 Thess. 3:5—NIV).